This year I only attended the Saturday of this two day festival in the Warwickshire countryside which is put on annually to raise money for the Napton Music Festival Trust. The early part of the day included on the main stage rock cover band Singe with a well played selection of classics from the 60''s to the 90's, impressive German singer/songwriter Michael Eb and one of my favourite artists Kristy Gallacher making her debut at the festival and very impressed with the brand new material she performed. 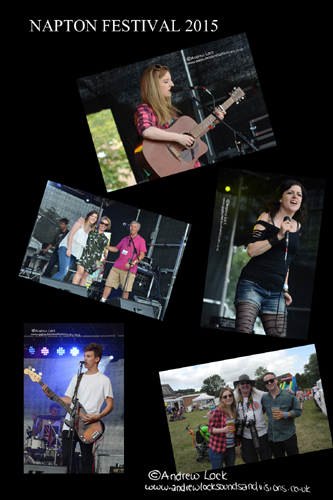 Making a return to the main stage after last year was Nina Baker and her band who seem to have beefed up their live sound a little while early doors on the acoustic stage there were also returns for Dial Emma and young singing sensation Rose Marsden. The weather was kind again this year while not as hot as 2014 while the turn-out was as good as usual.